Try your luck at Bhandardara Fireflies Festival. 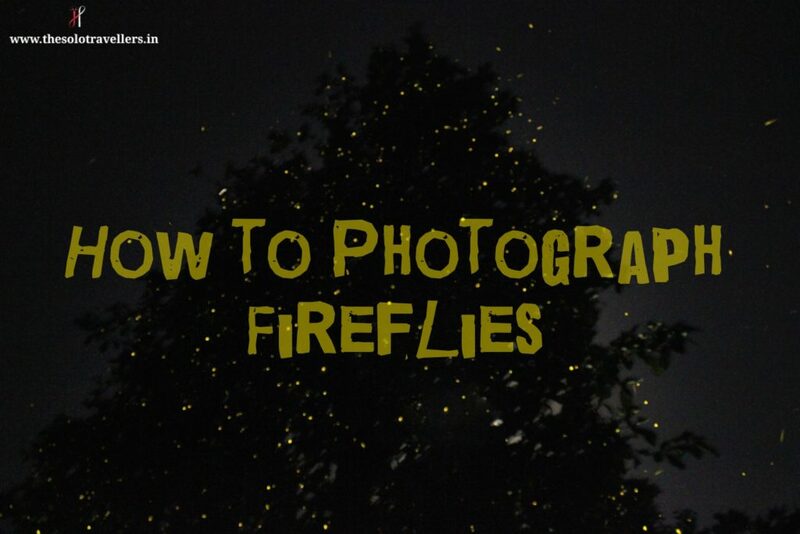 Simply photographing the fireflies is not enough. The same rules for composition apply. You have to know your gear, mainly its ISO, Aperture and Shutter, as sometimes you need to go as high ISO as 6400. Make your exposures in full manual mode, including manual focus. Set the focus to infinity. Determine your aperture, shutter, and ISO settings experimentally. You can use f/2.8, 15 seconds, and ISO 200 as a starting point. If your camera supports long-exposure noise reduction, it is usually a good idea to turn it on. Try between 03 and 25 second exposures with the camera mounted on a sturdy tripod and triggered by a remote shutter release. The biggest problem with taking pictures of fireflies is that the flash of light is not very bright. We can see it just fine, but to record it well on our camera sensor, we have to use a high ISO and wide aperture. The ISO and aperture control, how bright the light will be in the photo. The shutter speed only affects the linear distance of the light. The particular ISO, aperture, shutter speed combination you use will depend on the shooting situation. In all cases, you’ll want to shoot with an aperture as wide as the needed depth of field will allow—f/5.6 or wider. If you are shooting a wide-angle scene, you can probably get enough depth of field at f/4 or maybe even f/2.8. Don’t worry about depth of field with the firefly flashes. Set you focus based on the overall scene. Any flashes that occur very close to the lens will not be sharp, but it probably won’t matter as they’ll be moving anyway, and fuzzy firefly flashes usually look just fine. Typically, you’ll want to use an ISO of at least 3200. Lower ISO will show some flashes, but they won’t be as bright and the faint ones won’t show at all. After you get the aperture and ISO set, choose the shutter speed based on that combination. If you’re shooting a scene that has other lights in it, or perhaps a twilight sky or stars, you’ll have to use a shutter speed that will give you a proper exposure and that doesn’t blow out anything. With such a big aperture and high ISO, the shutter speed could be fairly short, and may not be long enough to capture the entire duration of the flashes. You can either go with that or hope for multiple flashes to show up, or you can shoot several exposures and blend them in Photoshop. If it’s totally dark and there are no other lights in the scene, you can shoot as long a shutter speed as you like from an exposure standpoint. However, noise will be a big issue with long exposures at high ISO. To capture just the flashes in a dark environment, I like to keep the shutter speed to no more than 15 seconds. If I need more flashes to show up, I simply blend multiple exposures. While long exposures do increase the noise, if you are capturing only the flashes during these exposures and blending those with a scene shot at a shorter speed and lower ISO, the noise probably won’t be an issue. Noise only shows up in the dark parts of the frame, not in the flashes. So when you blend the exposures and use the “Lighten” blend mode to let only the flashes show through, the noise gets left behind. Search Milky Way as background, set your tripod and camera. Focus on tree where you can see fireflies. Set the aperture to f/4, ISO to 1600, and the shutter speed to 25 seconds as a beginning point. You may have to fudge based on the ambient light. The idea is to use a high ISO and wide aperture to capture as much of the flashing as possible. The fireflies can go minutes without flashing or go crazy over a few seconds. To make sure you get plenty of flashes, set the shutter on continuous, lock down the cable release, and come back in an hour. Then, without changing anything else, focus on the sky and shoot an aperture/shutter speed/ISO combination that will record the stars well. Shoot one exposure for the sky and you’re done with the fieldwork. Now, back at the laptop, choose how many shots you want to use, based on how well the fireflies flashed. Load them as a stack in Photoshop and use the Lighten blend mode, which will allow all the flashes to show through. Now flatten the file and blend it with the shot for the sky. That’s it! your needs? I wouldn’t mind producing a post or elaborating on a few of the subjects you write in relation to here. 1B4Kgq Wow, great article.Thanks Again. Really Cool. I precisely needed to thank you so much yet again. I am not sure what I would have achieved in the absence of the entire tricks documented by you over that field. Previously it was the depressing difficulty in my position, but witnessing a new skilled technique you resolved it made me to weep with contentment. Now i’m happy for your assistance and pray you are aware of an amazing job that you are doing training most people all through your blog post. Most probably you haven’t got to know all of us.